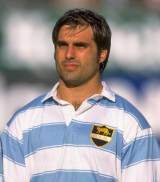 Arbizu began his rugby education with the amateur Belgrano Athletic Club in Buenos Aires and was one of the first Argentine players to make the move to the professional game in Europe. He made his international debut as a 19-year-old against Ireland in 1990 and in 1992 he became their youngest captain when he led the side against Spain in Buenos Aires. He played in three Rugby World Cups (1991, 1995 and 1999) and missed out of a fourth in 2003 because of injury. The last last of his 87 caps came against Italy in 2005. During his time in France, he played for Brive, Bordeaux-Bègles Gironde, Section Paloise and Aviron Bayonnais before moving to Italian club Parma.